A jewelery collection dedicated to the iconic Boucheron serpent, protective spirit and symbol of eternity. Delicately sculpted and polished, gold enhances the brilliance of diamonds. Serpent Bohème pendant S Motif Pendant set with pavé diamonds, in white gold. The snake, an icon of the archives is reborn with a modern and surprising twist thanks to Serpent Bohème. The head of the animal is crowned with gold beads that are highlighted by the emblematic twisted chain. The pendant takes on a modern look. Serpent Bohème long necklace L Motif Long necklace set with pavé diamonds, in yellow gold. The Serpent Bohème long necklace expresses with elegance the Maison Boucheron's codes. The expert work of the Hands of Light and the stone setters is highlighted with the multi-wear long necklace that can be worn also as a double-tour necklace, or as a brooch thanks to a stunning pin set with pavé diamonds. Iconic and contemporary, the drop motif set with pavé diamonds and crowned with thin gold beads adorns today's new aesthetics. New jewelry pieces now match the mystical rings and create timeless sets to complete upon your desire, as the Serpent Bohème pendant. Serpent Bohème long necklace 13 Motifs 13 paved motifs long necklace, in yellow gold. The Serpent Bohème long necklace expresses with elegance the line's codes. Serpent Bohème long necklace 13 Motifs 13 paved motifs long necklace, in white gold. The Serpent Bohème long necklace expresses with elegance the Maison Boucheron's codes. 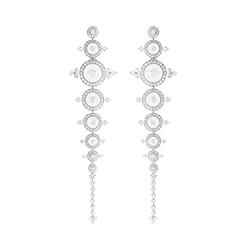 The drop motif is bordered by gold beads with finesse, a jewellry work specific to the Maison Boucheron. Long necklaces offer style for everyday and this openwork version perfectly expresses the spirit of the collection and an elegant look. Its fineness offers the opportunity of wearing several long necklaces together. The Serpent Bohème long necklace expresses with elegance the line's codes. 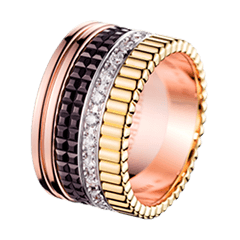 The drop motif is bordered by gold beads with finesse, a jewellry work specific to the Maison Boucheron. Long necklaces offer style for everyday and this openwork version perfectly expresses the spirit of the collection and an elegant look. The necklace Serpent Bohème expresses with elegance the line's codes. 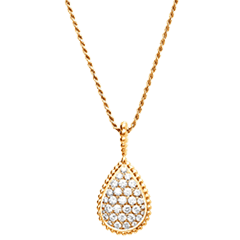 The drop motif is bordered by gold beads with finesse, the diamonds are highlighted by the openwork honeycomb and the twisted chain is enlarged. The reinterpretation of the Maison’s classics combined with new dimensions and contemporary style make this necklace a quintessential and timeless Boucheron emblem. The Serpent Bohème long necklace expresses with elegance the Maison Boucheron's codes. The expert work of the Hands of Light and the stone setters is highlighted with the multi-wear long necklace that can be worn also as a double-tour necklace, or as a brooch thanks to a stunning pin set with paved diamonds. 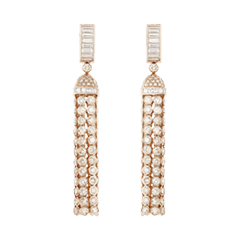 The drop motif is bordered by gold beads with delicacy, the diamonds are highlighted by the openwork honeycomb and the twisted chain is enlarged. The art of the Magician of Stones consists in accentuating the brilliance of the stones by using the grain setting technique: the head of the serpent is highlighted and magnified. 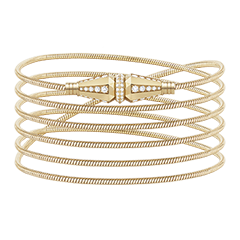 The dazzle of this line is enhanced by the delicate gold beads that surround them. All of this magic is reflected in the Serpent Bohème pendant. Nearly 50 years after its launch, the Serpent Bohème collection has been reinvented with colorful, transparent, and hard gemstones. Set with white mother-of-pearl and crowned with gold beads, this spellbindingly delicate long necklace embodies the free spirit and subversive power of Boucheron. Nearly 50 years after its launch, the Serpent Bohème collection has been reinvented with colorful, transparent, and hard gemstones. 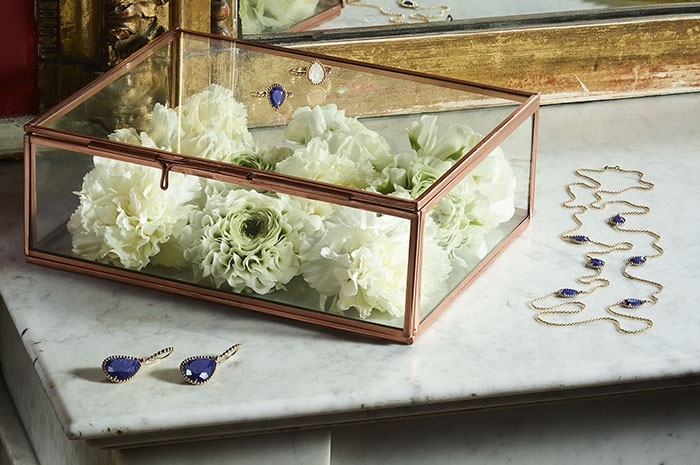 Set with lapis lazuli and crowned with gold beads, the spellbinding aesthetic of this long necklace embodies the free spirit and subversive power of Boucheron. Nearly 50 years after its launch, the Serpent Bohème collection has been reinvented with colorful, transparent, and hard gemstones. Set with onyx and crowned with gold beads, the spellbinding aesthetic of this long necklace embodies the free spirit and subversive power of Boucheron. Nearly 50 years after its launch, the Serpent Bohème collection has been reinvented with colorful, transparent, and hard gemstones. Set with citrine and crowned with gold beads, the spellbinding aesthetic of this long necklace embodies the free spirit and subversive power of Boucheron. The yellow gold Serpent Bohème long necklace is dotted with six drop motifs that subtly evoke the animal. Sensual and delicate, Serpent Bohème has been the choice of sassy women since 1968. Serpent Bohème exalts femininity. The six drop motifs set with diamonds in the sautoir version gracefully and sensually adorn the neck and shoulders. 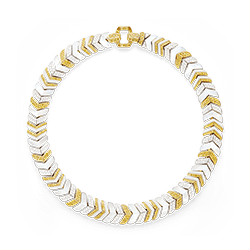 This Serpent Boheme white gold necklace perfectly expresses the codes of this emblematic line. 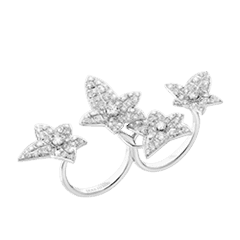 With 23 motifs set with diamonds in a honeycomb formation and juxtaposed, the drop motif is gracefully highlighted. 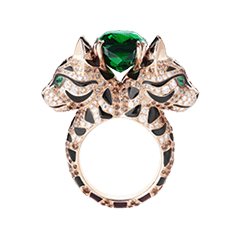 Conceived in 1968, Serpent Bohème has transcended eras and become one of Boucheron’s most iconic collections. In this elegant, yellow gold choker, 6 large teardrops and 8 small teardrops set with diamonds run along an over-sized, twisted chain. Two bouncy tassels fall against the nape of the neck and finish off this necklace with the most beautiful, feminine touch. 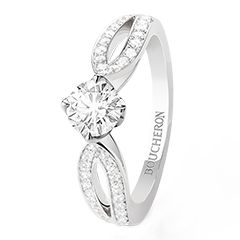 Produced by Boucheron’s workshop for the first time in 1968, the Serpent Bohème collection has transcended eras and emerged as a classic. In this elegant, white gold choker, 6 large teardrops and 8 small teardrops set with diamonds run along an over-sized, twisted chain. Two bouncy tassels fall against the nape of the neck and finish off this necklace with the most beautiful, feminine touch. This Serpent Bohème long necklace, richly decorated with sixteen drop motifs, combines the shimmer of white mother-of-pearl with the sparkle of diamonds. Subtle and with lovely proportions, the look is free and sensual. The Serpent Bohème woman wears diamond and lapis lazuli together with panache. This stylish long necklace combines all the codes of this collection that is so dear to Boucheron. The drop motif, the sculpted gold and the twisted chain are the hallmarks of this creation so expertly crafted by the Maison's artisans. With its charming combination of diamonds and citrine drops, this yellow gold long necklace is seductively modern. 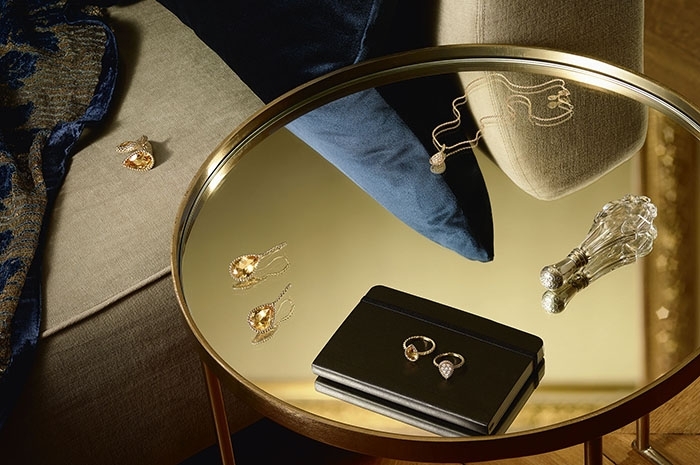 Its carefully twisted yellow gold chain is a hallmark of the Serpent Bohème collection, which showcases the meticulous craftsmanship of Maison Boucheron's artisans. The long necklace's twisted chain is classic Maison Boucheron. Finely crafted, it complements to perfection the six Serpent Bohème motifs in diamond and rhodolite garnet. The collection offers a subtle and vibrant piece in this long necklace with sixteen motifs set with rhodolite garnet. The snake is a protector animal and a symbol of infinity. It is represented figuratively here with a series of drops adorning the woman's neck. Signature of the Maison Boucheron, the yellow gold twisted chain is finely crafted to complement to perfection the six Serpent Bohème motifs set with malachite. The long necklace with sixteen motifs set with malachite is a subtle bohemian addition to the collection. This reinterpretation of a 1970s design brings with it the free and subversive spirit of that period. SERPENT BOHÈME NECKLACE, 23 MOTIFS 23 motifs necklace paved with diamonds, in yellow gold. Serpent Bohème, one of the Maison's iconic collections, liberally goes to town on the codes. The twenty-three drop motifs in yellow gold and diamonds are juxtaposed for a deliberately oversize look. SERPENT BOHÈME NECKLACE, 23 MOTIFS 23 motifs necklace paved with diamonds, in pink gold. Famous throughout the world for its daring innovative style, the Serpent Bohème necklace in pink gold and diamonds plays on the codes of the unexpected with an oversize drop motif. The juxtaposition of the large motifs reveals the exuberance of the collection. The Serpent Bohème collection abounds in mystery. This long yellow gold necklace with six drop motifs embellishes the neckline with turquoise blue. This Serpent Bohème yellow gold long necklace has 16 turquoise blue and diamond drop motifs. The gems are resplendent against the skin.